Nelumbo nucifera known as Sacred Lotus or Egyptian Lotus is native to India, Indonesia, the Philippines, Egypt and Australia. This plant produces large dinner plate sized leaves and large pink fragrant blooms. Both leaves and blooms are elevated out of the water by a few feet or more, making this a spectacular addition to any pond. They are quite easy to grow if planted in full sun to part shade. The root is very tender and must be handled with care to make sure it isn't damaged. Bury it in heavy mud in a pot or at the bottom of a pond or creek a few feet below the water level. Do not let the roots freeze. The leaves and blooms will reach 4 to 6 feet high and even higher under ideal naturalized conditions. Blooms occur spring through summer with an occasional feeding of the roots. Fertilizer can be wadded into a coffee filter, then plunged into the mud near the roots, or use the pellet form. Seed pods form that can be used in dried flower arrangements. Propagation is by division of the large fragile roots or by seed. This will likely be your favorite blooming water garden plant. The leaves are fun to watch when a few drops of water hit them because they are impervious to water. The water drops roll around the leaf like mercury from a thermometer, never penetrating the skin. 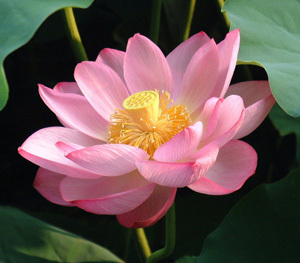 All parts of the lotus have been used at one time or another as food, traditional medicine, a narcotic or as a tea. Over 600 cultivars have been developed as hybrids of Nelumbo nucifera (Asian Lotus) in various shades of red to white. 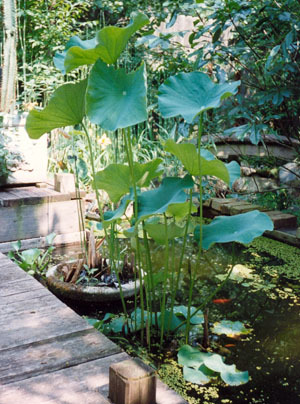 A personal recollection: I once had five ponds in my Atlanta garden, one of which held a pink lotus (above photo) that a friend brought to me from the lake next to his childhood home in Florida. Every spring they put on a spectacular show, as the arrow shaped new sprouts shot straight up from the depths of the mud, climbing higher into the air. Then ingeniously the "arrow tip" leveled off to unfurl a new dinner plate sized leaf. A few months later the magnificent lotus buds appeared, eventually opening, allowing their alluring scent to perfume the garden. I still have dried lotus seed pods from that time.